Originating in Australia, the macadamia is fast becoming one of the most desired snacks and confection products in the world. Macadamia butter is made through roasting, usually split and sub-snack-grade such as shrivelled nuts, and then milling the roasted nut down into a butter while optionally adding items like salt, sugar, spices, chocolate, cocoa, emulsifier and additional oil should the nut be low on oil or due to economic reasons. Some processors prefer to mill unroasted nuts for use in other products that are later heated and where the taste is enhanced in the final product. When pressing oil from macadamia nuts, the oil cake may also be milled down into a low fat flour to be used in cooking and sweets processing. ABC Hansen supplies all equipment in this process in various capacities namely roasters operating with gas, electricity and diesel / industrial oil, de-skinners / blanchers (for split nuts and also for snack nuts). The heart of the system is of course the Universal mill with plate attachment. Each mill can process more than 240kg of macadamia butter per hour with 11kw motor and the plant can be scaled to the buyers’ requirement. 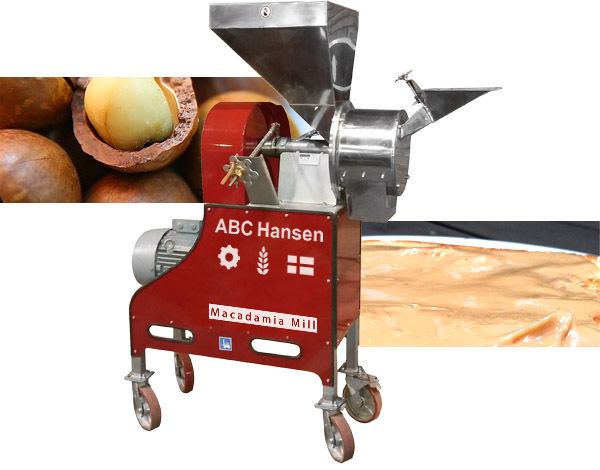 ABC Hansen also supplies Hippo hammer mills which, with its cast iron milling plates is able to grind down macadamia shells into a fine powder. Sometimes the hammer milled powder can be further ground down by means of a stone mill. These shells are extremely hard and when milled fine are used as a cosmetic scouring agent for facial treatment and as basis for wood glue. The cosmetic application is particularly interesting as it floats and does not settle in and clogging up plumbing pipes as silica does, while doing as good and better a job of scouring skin. Universal mills are made with stainless steel contact parts.